The nation’s top education official says the federal government will forgive loans taken out by tens of thousands of students who attended campuses owned by the for-profit college company. 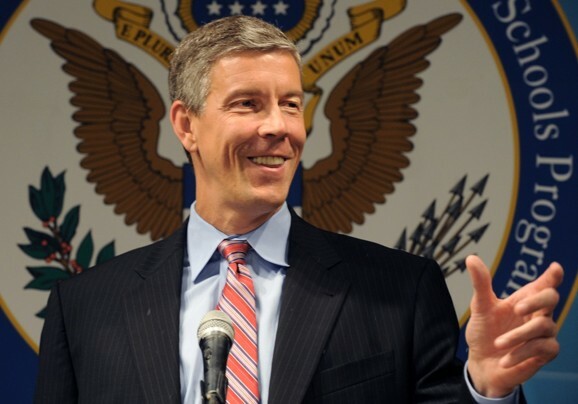 The move announced by Secretary of Education Arne Duncan comes just a few weeks after Santa Ana-based Corinthian declared bankruptcy and shut down its schools. The company ran the Heald Collge, WyoTech and Everest schools. Corinthian has faced numerous accusations of fraud – most notably for shady recruitment practices and overstating the job placement rate of graduates. Its demise was all-but-sealed when the U.S. Education Department reduced its access to federal aid last year. That prompted Corinthian to sell off dozens of campuses. The final nail in the coffin was a $30 million federal fine announced in April. Duncan says some for-profit colleges “brought the ethics of payday lending to higher education. In addition to announcing loan forgiveness for Corinthian students, he says the government will develop a process to allow any student to be let off the hook if they’ve been defrauded by their college. The move could be costly for taxpayers. The New York Times says that if all Corinthian students over the past five years had their debts forgiven, the tab could be more than $3 billion.